This unique balsam effectively copes with the majority of gastrointestinal diseases, quickly heals wounds and sores, aids in cases of colds, calms the heart and nerves, and increases vitality. It is a wonderful product for skin care. 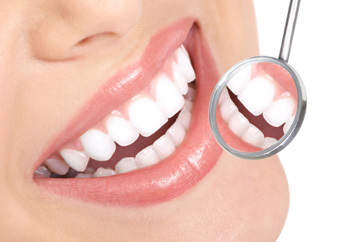 If you do not want to visit your dentist too often, you can carry out the following procedure each day. After brushing your teeth with a basic toothbrush and basic toothpaste, rinse your mouth and place several drops (4 to 8) of 3% turpentine balsam on your brush. Brush your teeth one more time. Yes, it could conceivably be slightly bitter, but be patient for two to three minutes (you can always do what else you do in your bathroom), and rinse your mouth. This procedure, repeated two to three times a day, will help free you from toothaches, inflammation of the gums, first and second degree periondontosis, periodontitis, stomatitis, gingivitis, etc. Can this really be a bad thing? After all, your enchanting and candid smile is worth it! Yes, with regard to already existing periodontosis: in this case, you must brush your teeth twice a day for five to six months. What did you expect? You shouldn't have let it go this far.... Just put up with it! And so what if you will smell like a Cedar cone? You will be all the more healthy for it! Do you use special products to remove makeup? Yet another product to remove eye shadow? Or lipstick? Well, you may be surprise and not believe this, but Cedar nut oil handles this task very well. You don't believe it? Try it yourself! Especially since you can convince yourself of this very quickly! Moisten a cotton swab in cedar nut oil (3% turpentine balsam may also be used) and use it to wipe those areas where the cosmetics were applied. Smile at yourself in the mirror. Why? Why do you think? 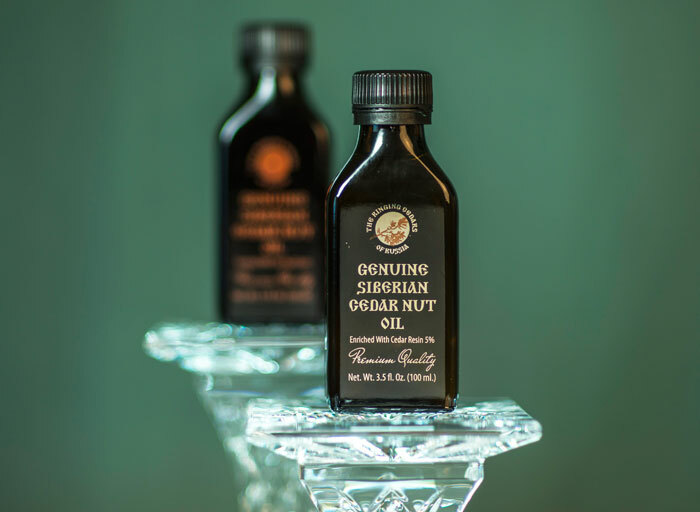 You have not only removed the window dressing from your face, but at the same time have given a gift to your skin: you have "oiled" it with the power and energy of the cedar. And your skin is very sensitive to gifts like these, and therefore will also show its gratitude to you over and over again! The hair.... A genuine miracle that God devised in order to bring delight to a great many people, especially of the male persuasion. Well, what else can we say if your hair argues with a clump of grass about who has the right to be called straw? It is not always possible to see the connection between losing weight and thinning hair, but everything is really very clear: a woman's adipose tissue is not simply fat, but an organ that fulfills a hormonal function. If a woman, not suffering from obesity but striving only to attain the Hollywood ideal, loses 10% of her body mass, then this leads to an albumin deficit and a mineral unbalance. As a result, an elegant figure is accompanied by thinning hair and cracked nails. But what can be done when the hair is already like this, sickly and worn out? It turns out that the hair can be healed! Before washing your hair, and especially if your hair is coloured, give your scalp a ten-minute massage. Using circular motions, massage your scalp with the tips of your fingers, simultaneously rubbing in 3% turpentine balsam. After the massage, wipe the hair with the turpentine along its entire length, separating it into small strands. For the oil to be better absorbed, rub your hair with your hands over steam. In 20 minutes your hair can be washed. If your hair is dry, brittle, split and broken at the ends, then, in addition, rub 3% turpentine balsam into the ends of your hair after washing. The cedar nut oil gently and thoroughly tends to your hair, making it more manageable, soft, with a natural glow, restores the structure of the hair, smoothes and evens the surface of the hair shaft, prevents tangling and makes combing easier. The cedar resin speeds up the processes of cellular renewal immediately along the entire length of each hair, and this makes it possible to improve the hair much more quickly than if it grew out anew. At the same time, turpentine balsam does a good job of moistening and nourishing the scalp. It stimulates metabolism and blood circulation in the layers of the scalp, which, in addition, leads to an increase in the vitality of the hair. It offers protection from the effect of atmospheric factors. It regulates the activity of the sebaceous glands, eliminates dandruff, and relieves irritation and itching. Take care of your hair this way for 10 to 13 procedures (one and a half to two months) and you will not recognize your own hair -- the result will be that amazing! After this, you will simply give or throw away all your accumulated foreign and domestic shampoos, conditioners, rinses, sprays, etc. Leave only the simplest and cheapest shampoo to keep your hair clean. Everything else will be done for you by the turpentine balsam (in treating your hair) or simple cedar nut oil (after the treatment). For a better result, we advise you to include the cedar oil in your morning meal (one tablespoon 30 minutes before eating), for which your hair will be very happy, since the oil contains a high quantity of polyunsaturated fatty acids and the vitamins A, B1, B2, and E, in which it is so lacking! Yes, it's true. It is precisely the neck that gives away a woman's age. Why conceal it: the skin of the neck ages quickly if it is not cared for. But all too often, when concentrating on the face, we forget about the neck, which is simply unforgivable! You pay attention to how you sit, how you walk, the type of pillow you sleep on. But do you also "wash" your neck for the night as you would your face? Perhaps you wash it only when you take a shower or bath? This will not do! Because it joins your wonderful head to your no less wonderful body, your neck takes on a lot of work by helping our eyes easily move in space and managing to notice the most important and significant things around us. And so, the skin of the neck more quickly becomes covered with small wrinkles and microscopic folds, which are more and more noticeable with age. So, why not help your swan-like neck always be in good form? Or are you not the mistress of your own beautiful neck? Prepare a small quantity of lotion, which may later be kept in the refrigerator: mix an egg yolk with the juice of one lemon or orange, add one tablespoon of vodka and five tablespoons of 3% turpentine balsam (do not use a metal spoon!). Mix carefully and pour into a glass jar with a tight fitting lid. Take a cotton swab, place 3 to 10 drops of the lotion on it, and apply it to the skin of your neck. Leave it for 13 to 20 minutes. Then wash it all off using warm water with upward motions, and rub 100% cedar nut oil onto your neck. After these procedures, your neck will serve your body for a long time yet, proudly carrying your intelligent and beautiful head throughout the years! Every day we use dish-washing products, detergents, and cleansing gels and pastes for tiles and bathroom fixtures. Our hands are burnt by the sun, frozen by frost, and chapped by the dusty wind. And the result of all this is dryness, red spots, cracks, wrinkles, and disruptions of the blood circulation. But, in spite of this, each woman wants to have beautiful and elegant hands. How to achieve this desirable state while expending the minimum amount of time? How can we protect the skin of the hands? Place your hands in hot water. Keep them there for a little while. Then put them in cold water. You're wincing! Again into the hot water. And the cold. The hot.... Stop, stop! That's enough! Don't get carried away! Using a soft towel, wipe your delicate hands and rub in 3% turpentine balsam. It should be rubbed in with motions as if you were putting on gloves, that is, from the tips of your fingers to their base, and further along your entire palm, alternating one hand, then another. After rubbing in the turpentine, massage your hands, smoothing them, rubbing and kneading them. It is best to carry out this procedure in the morning. But also in the evening, before sleep. And in general, do it whenever you can, it is very beneficial! At the end of even a week, your hands will again become soft, delicate, and caressing. Even if you are 43, it will be impossible to determine your age by your hands. Oh, these painted nails! Have you ever read what nail polish or nail-polish remover contains? No, well you should just once. Even the assurance that the product does not contain acetone means nothing. Imagine how reactive the solution must be in order to dissolve the nitrocellulose and synthetic resins contained in nail polish. When dissolving the resins, these substances simultaneously remove the fats from the nail surface and dehydrate it. And the nails become brittle, fragile, begin to flake, causing their owner much unpleasantness. How can this be avoided? Actually, it is simple! If, of course, you have on hand 3% turpentine balsam. Rub the cedar balsam into your nails daily and frequently. This will not make them worse! But better -- it is simple! Even as your nails begin to grow out, you will really, with your own eyes, see the mark on your nails -- prior to the application of the turpentine and after! If your nails are ribbed, uneven or jagged, then the newly growing nail will be straight, even, and what is the most amazing, it will have a beautiful pearly sheen. What's more, it's a sheen that gives you the feeling that the nail is covered with polish. But, as you realize, the point is not the polish. By beginning the processes of regenerating new cells, turpentine balsam is simply doing its job -- it is returning your nails to the state that is natural to them from birth. That is the entire secret. What should you do if you have dry skin on your elbows, knees, or the balls of your feet? Of course, you have already guessed! That's right, you must simply lubricate them with turpentine balsam. It is most probable that ordinary cedar nut oil will be sufficient. After all, the dryness of the skin in these areas arises precisely because it is constantly creased, contracted, expanded, distorted. And so, for its renewal it constantly requires nutrients, which, because of the thinness of the skin, are not very successfully provided by the body. But why should we not help? If you have microscopic cracks on your beautiful heels, here is a good recipe for getting rid of them. Mix 3% turpentine balsam with honey (1:1), soak a gauze napkin in this mixture and apply it to the cracks on your heels, cover this with cellophane and wrap a bandage around it. Change the bandage twice a day. Repeat the procedure for four to five days. If the dryness of the skin on your heels increases, use 3% turpentine balsam -- the skin on your heels is so severely dehydrated that it is taking in the turpentine balsam like a gift from heaven. Do not deny your heels this pleasure, lubricate them until they absorb the Cedar balsam. Cellulite is a disruption of metabolism in the subcutaneous fatty cellular tissue, the intercellular space is clogged with surplus fat, water, and products of excretion. For that reason, all programmes are directed toward one thing: to eliminate stagnant phenomena, increase the tension of the vessels, strengthen the muscles, improve metabolism, and, of course, destroy the accumulation of altered fat cells. Bright young women have devised an excellent method for fighting cellulite: during a shower, the body is rubbed with a hard loofah or brush, after which 3% turpentine balsam is rubbed into the appropriate areas and wrapped with cellophane and a blanket for 20 to 30 minutes. Two to four glasses of water should be drunk, the more, the better. A massage improves lymph drainage and the microcirculation of the blood, helps to break down cells that have become compressed into a layer. 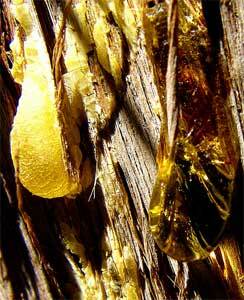 Turpentine balsam penetrates deeply into the skin and increases metabolism at the cellular level tenfold. Because of the increased supply of oxygen to the cells, the fat cells that have been manipulated by the massage are burned up and are removed from the body through the blood and perspiration together with other residues and toxins. It is precisely because of this that it is necessary to drink this much water. The resin completes the treatment, beginning the process of regenerating new cells that are capable of maintaining a balance in metabolism, which in the future will not permit the appearance of surplus fat and other products of excretion in the intercellular space. For the first 13 days, it is necessary to massage the skin and rub in the turpentine balsam twice a day. Then switch to once a day. Do not forget that the morning procedure is three to four times more effective than the evening procedure. The size of the body after three to six weeks will decrease up to 3 centimetres, the suppleness and elasticity of the skin will increase. For those who want to obtain a more dramatic result, it is best to eliminate cigarettes from your life, as well as coffee, cola, Sprite, and similar beverages with artificial additives. These are all unnatural and toxic, and are perceived by the body as foreign substances, which, one way or another, will turn up in the intercellular deposits of your cellulite. There are restrictions in this procedure: do not use a heating blanket in cases of varicosis, do not "warm up" the area of the small pelvis in cases of gynecological disorders.